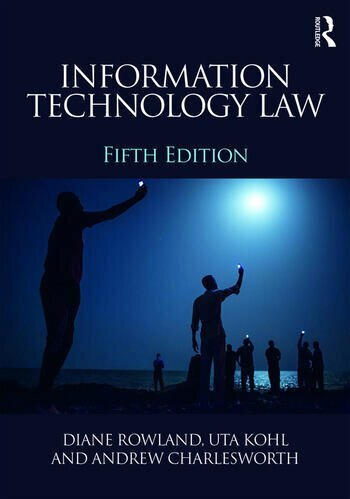 The fifth edition of Information Technology Law continues to be dedicated to a detailed analysis of and commentary on the latest developments within this burgeoning field of law. It provides an essential read for all those interested in the interface between law and technology and the effect of new technological developments on the law. The contents have been restructured and the reordering of the chapters provides a coherent flow to the subject matter. Criminal law issues are now dealt with in two separate chapters to enable a more focused approach to content crime. The new edition contains both a significant amount of incremental change as well as substantial new material and, where possible, case studies have been used to illustrate significant issues. • The expansion of the ICANN gTLDs and the redesigned domain name registration and dispute resolution processes. Diane Rowland is an Emeritus Professor of Law at Aberystwyth University, UK. Uta Kohl is a Senior Lecturer in Law at Aberystwyth University, UK. Andrew Charlesworth is a Reader in IT Law at the University of Bristol, UK.